However, this does raise another important question: Why...if the individual market is so horrible and impossible to make a profit in (which obviously isn't true, but that's another discussion) that they had no choice but to pull up stakes entirely...why would they stick around in the off-exchange individual market selling what are essentially identical plans (and in some cases, the exact same plans) directly to the enrollees? Remember, all ACA-compliant plans are part of the same risk pool. This includes exchange QHPs, off-exchange QHPs and off-exchange ACA-compliant non-QHPs (how's that for a mouthful?). To the best of my knowledge, the only "major medical" individual market policies which aren't part of the ACA risk pool are Grandfathered and Transitional plans...neither of which can be newly-enrolled in anymore (and most of which have been phased out by now...I estimate there's only 1-2 million people still enrolled in these nationally today). Before I go on, a few caveats: I don't know for certain which states they'll stick around in off-exchange in, nor do I know which counties within those states they'll be available in. Finally, I don't know which plans they'll be offering in those counties...they might be the same QHPs currently sold, or they might be plans which are ACA-compliant but aren't full QHPs. HOWEVER, assuming that Aetna is planning on keeping QHPs available off-exchange, the question is why? Wouldn't they still be just as likely to lose money on them? Only 15% of exchange enrollees are paying full price for their QHPs. 100% of OFF-exchange enrollees are paying full price for theirs. Yep. Anyone enrolling in Aetna's off-exchange policies is almost certain to have an income of at least 400% FPL (technically there's nothing stopping those below that threshold from paying full price, and I'm sure some do so for various reasons, but the vast majority are likely to be at around 400% or higher). 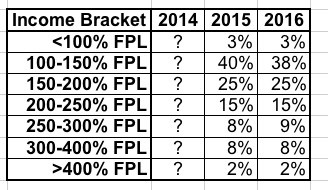 So, again, just about everyone on the exchanges is under 400% FPL, while just about everyone off the exchanges is over 400%. So why does that make a difference? Well, I don't know this for certain, but I'd be willing to bet that people with higher incomes probably tend to be healthier in general...or, at the very least, they tend to have already been receiving regular medical/healthcare insurance coverage prior to the exchanges launching, and are therefore far less likely to be entering their ACA-compliant policies needing pricey treatments, services and medications. One of the major features of the ACA was supposed to be to prevent insurance carriers from discriminating against people based on their medical history or pre-existing conditions (with smokers being the main exception). The only major way carriers can "tell" how healthy/expensive an enrollee is likely to be now is by how old they are...and they're still required to offer coverage, charging no more than 3x as much to an older person than a younger person. However, there's one more workaround which could be at play here: By only offering policies off of the exchanges, the carriers are able to effectively weed out anyone those below a certain income level...and therefore weed out a population more likely to require expensive treatment. Any time you regulate an industry, especially one with a history of, shall we say, less than the highest ethical or moral standards, they'll do everything in their power to find a loophole to get around those regulations. In the case of the ACA, one of the major provisions of the law is guaranteed issue: The idea that insurance carriers are required to offer policies to everyone regardless of their medical history or health status. As such, aside from their contact information, carriers can no longer ask any nosey personal questions other than their location, age and gender. The only specific medical question which can be asked is whether they smoke or not, I believe. While they can ask the enrollee's gender, they aren't allowed to price the policy based on that, and while they get to know the age of the enrollee, there's a limit on how much the rate can vary depending on age. However, there are still plenty of ways of getting around these rules, and the carriers are all over it. For one thing, they know that the vast majority (around 85%) of on-exchange enrollees receive federal financial assistance (APTC/CSR), and the income data (in aggregate) is published publicly, along with other general demographic info (ethnicity, metal level of plans selected and so on). It's probably safe to assume that the lower income an enrollee is, the more likely they are to be a "bad risk", since it's far more likely that they were uninsured (or underinsured) prior to signing up through the exchanges. Well, now it looks like some carriers may have decided to skip right past the "commissions for these plans, but not for those plans" phase and cut straight to the "pull off the exchanges" phase. Participation in the exchanges at all is, currently, voluntary on the part of the insurance carriers; as far as I know, they can't currently be required to offer exchange-based policies. However, this at least helps explain why they're pulling off the exchanges while remaining in the states off-exchange. Presbyterian’s current 16,000 enrollees in its off-exchange insurance plans, those who receive coverage through employers and those in small group plans will not be affected by the change. Presbyterian insures over 466,000 New Mexicans. The largest group is its Medicaid line, with 220,000 enrollees, followed by 170,000 commercially insured individuals and 45,000 Medicare Advantage enrollees. (ii) All health insurance policies issued or delivered for issuance in the state in the applicable market (or markets) are discontinued and not renewed. (2) An issuer that elects to discontinue offering all health insurance coverage in a market (or markets) in a state as described in this paragraph (d) may not issue coverage in the applicable market (or markets) and state involved during the 5-year period beginning on the date of discontinuation of the last coverage not renewed. On the one hand, this kind of overshadows my main theory above (although Baillio's New Mexico example shows that the "cherry-picking" theory is also a likely reason, if perhaps a secondary one). @rebeccastob @charles_gaba This indicates that carriers still see opportunity in market, but are waiting for stabilization. @ddiamond @CitizenCohn @JeffYoung Which is to say, we shouldn't panic til carriers start leaving nongroup market altogether.